Pink Martini's Joy To The World: A Holiday Spectacular With timeless classics and rarely heard gems, the "little orchestra" spreads holiday cheer with the help of NPR's Ari Shapiro. 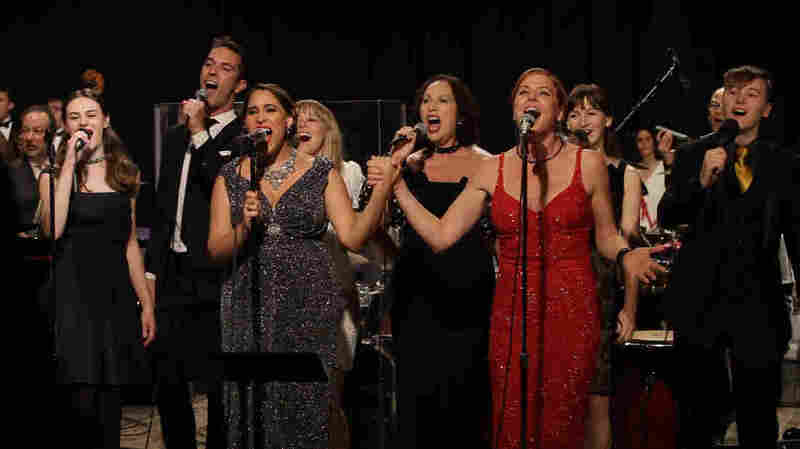 Pink Martini's Joy To The World: A Holiday Spectacular. The internationally acclaimed "little orchestra" Pink Martini decks the airwaves with festive holiday songs from around the globe. From timeless classics to rarely heard gems, here is a multi-denominational, multicultural jubilee that overflows with enough holiday spirit to warm your entire family. Joy To The World: A Holiday Spectacular will air on NPR stations throughout the holiday season. The hour-long program includes songs from Pink Martini's holiday album Joy To The World, as well as new holiday arrangements. The host of NPR's All Things Considered and longtime Pink Martini guest vocalist Ari Shapiro emcees and performs alongside bandleader Thomas Lauderdale and lead singers China Forbes and Storm Large. Additional guests include The von Trapps, Cantor Ida Rae Cahana and the Pacific Youth Choir. Ari Shapiro performs "Ocho Kandelikas" with Storm Large, China Forbes & Cantor Ida Rae Cahana. China Forbes performs "A Snowglobe Christmas." Storm Large performs "We Three Kings." China Forbes, Storm Large, Ari Shapiro, Ida Rae Cahana and The von Trapps perform "Auld Lang Syne" with the Pacific Youth Choir. China Forbes (vocals), "Little Drummer Boy"
Storm Large (vocals), "Santa Baby"
China Forbes (vocals), "A Snowglobe Christmas"
China Forbes, Ari Shapiro, and Ida Rae Cahana (vocals), "Elohai, N'tzor"
Ari Shapiro, China Forbes, Storm Large and Ida Rae Cahana (vocals),"Ocho Kandelikas"
Storm Large (vocals), "Do You Hear What I Hear?" China Forbes (vocals) with the Pacific Youth Choir, "Talj Talj"
Storm Large (vocals), "We Three Kings"
China Forbes and Timothy Nishimoto (vocals), Dan Faehnle (guitar), "Congratulations — A Happy New Year Song"
The von Trapps (vocals), "Noël Nouvelet"
China Forbes (vocals) with the Pacific Youth Choir, "Gardens Of Sampson & Beasley"
China Forbes (vocals) with the Pacific Youth Choir, "O Holy Night"
Storm Large (vocals), "Have Yourself A Merry Little Christmas"
China Forbes, Storm Large, Ari Shapiro, Ida Rae Cahana and The von Trapps (vocals) with the Pacific Youth Choir, "Auld Lang Syne"